The Queen Edith’s Community Forum aims to be a grass-roots organisation for everyone in our neighbourhood… and also its environment. We aim to build a greater sense of community within and around the Queen Edith’s area of the city and to help make it a better place to live, work, study or visit. As the various council boundaries are inconsistent, we’ve based the area we refer to as Queen Edith’s on the two Church of England parish boundaries, as shown below (click to enlarge). We have plenty of opportunities for more people to become active members. Our 2019 AGM report can be found here and accounts here. The Forum will remain politically neutral, but we will work with any local politicians for the benefit of the area. We aim to attend every City Council South Area Committee meeting and encourage others to do so. We are building stronger links with all faith-based groups in the area and meeting with other community groups. We work closely with City Council community development officers, housing department, Street and Open Spaces, our City Ranger Ed Nugent, and CHYPPs. We aim to get the best for our area from the services the Council provides and offers. Our priorities to date have been improving communications across the area; running small and larger scale events where people can get to know their neighbours and have fun; creating attractive places for people to come together; and supporting projects which will enrich our neighbourhood. Queen Edith’s Community News – our independently-funded local newsletter is delivered two or three times a year to over 4,000 homes, as well as public places. The QECN is also immediately available online via this website. Thanks to everyone who reads it and everyone who gives us such positive feedback. Online Information – We maintain this website and our Facebook page and distribute a weekly e-mail to subscribers. Networking – since we started we have sought to ‘meet everyone’ – to understand what people are doing and how we might work together. We now know lots of good places to have coffee (and cake) and also know lots of useful people doing good things in our community! Do get in touch if you think we could help your group, if you’d like to start a new project or get involved in an existing one. It’s really important to us that we encourage opportunities for people to get together, both through publicising events organised by other groups and by organising our own programme of activities. We also held a public meeting so that residents could hear about the vision for the Biomedical Campus which has such a strong influence over our neighbourhood; and an election hustings where people could meet the candidates for the County Council elections in May. Finally, we organise walks, concerts, litter picks and other social gatherings as time and interest dictate, and work with other groups such as CambridgeLIVE and the City Council’s CHYPPS playscheme to schedule events locally. In order to bring people together, we need to create spaces to accommodate them! Nightingale Community Garden: Since 2015, some local volunteers have worked with the City Council to develop a community garden in the former bowling green on Nightingale Park. Initially, this was with Friends of Nightingale Park, then with QECF. Since May 2018, a new constituted group has been set up Nightingale Gardeners Group, which has its own bank account and insurance. It is solely to support the volunteering in the garden. The garden remains the property and responsibility of the City Council and the Group members work very closely with their staff. Details of how you can get involved, opening hours etc, are on the garden website. You don’t need to become a member of the Group to enjoy the garden. We also collaborate with the City Council on the use of S106 ‘developer’ funding in the park more generally. We are (still) waiting for the almost derelict pavilion to be replaced by a brand new facility with sports changing rooms, a multi-use community room and kitchenette. There is also a City Council project to provide enhancements to the play area. We would like to see the community involved fully in designing these changes – do contact us if you’d like to be involved. In 2017, volunteers from Nightingale Garden, within the Queen Edith’s in Bloom project, bid successfully for a small RHS grant to develop the Wulfstan Way rain gardens. This very small-scale project, based outside the shops on Wulfstan Way, was developed with a local cub pack and is intended to create an attractive and sustainable planted area for the local community to enjoy. Local residents are getting more involved in its maintenance now, which is great. We are, however, very limited by a lack of water there. 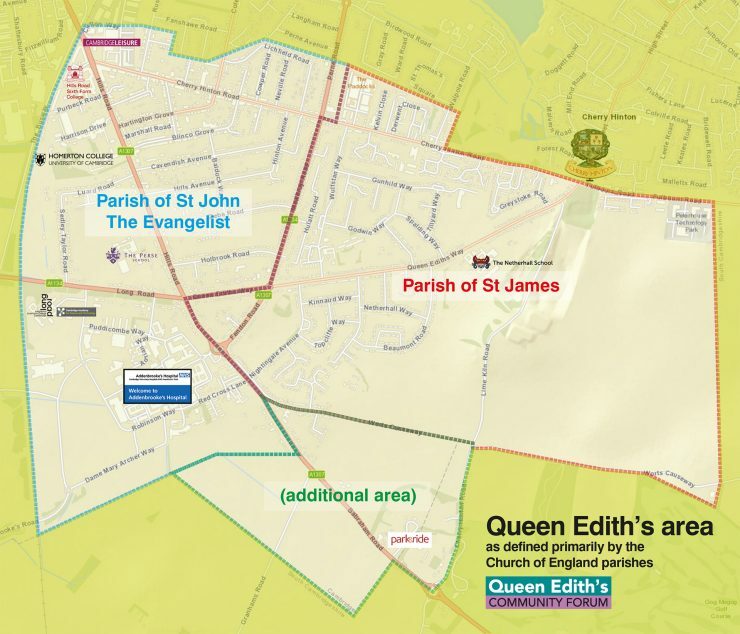 Queen Edith’s Active and Connected – a small project to gather what already exists on local places, groups and ways to stay active and connect with people. We hope we can promote these and it might also show gaps for future projects. Queen Edith’s – Capturing Our History – led by Roger Lilley and working with the Museum of Cambridge ‘Capturing Cambridge’ project and local groups including St John the Evangelist Church and Friends of Rock Road Library. Queen Edith’s in Bloom. This is registered with Anglia in Bloom, part of the RHS national ‘It’s Your Neighbourhood’ non-competitive community-building project. In 2019, it isn’t really active, beyond about two volunteers doing a few things locally with other keen gardeners. There is a page on it in the Nightingale Garden website. Neighbourhood Planning and Transport – led by Sam Davies – monitoring and publicising local housing, transport and related developments so residents can get involved and have their say. Wulfstan Way Shops – the area around the Wulfstan Way shops, cafe and pub are a key focus for local people. We’d like to support the traders (and GP practice) here and also investigate how we might use the area better and more frequently for getting the community connected. Our doors are always open to other local people – as individuals or groups. We are the sum of your time, energy and enthusiasm and we need your ideas and input. We want to build a group that welcomes everyone, is representative of the area’s diversity, and is active in bringing people together for the benefit of our part of Cambridge. Do get involved!